If you need the best performance, then use PolyBase to import data into Azure SQL warehouse. Solution: You use the bcp utility to export CSV files from SQL Server and then to import the files to Azure SQL Data Warehouse. You have an Apache Storm cluster. You need to ingest data from a Kafka queue. Which component should you use to consume data emitted from Kafka? To perform real-time computation on Storm, we create “topologies”. A topology is a graph of a computation, containing a network of nodes called “Spouts” and “Bolts”. In a Storm topology, a Spout is the source of data streams and a Bolt holds the business logic for analyzing and processing those streams. The org.apache.storm.kafka.KafkaSpout component reads data from Kafka. You plan to use Microsoft Azure IoT Hub to capture data from medical devices that contain sensors. You need to ensure that each device has its own credentials. The solution must minimize the number of required privileges. Which policy should you apply to the devices? Per-Device Security Credentials. Each IoT Hub contains an identity registry For each device in this identity registry, you can configure security credentials that grant DeviceConnect permissions scoped to the corresponding device endpoints. By the way, for option A: an iothubowner would have all permissions. You have a Microsoft Azure Data Factory that loads data to an analytics solution. You receive an alert that an error occurred during the last processing of a data stream. You debug the problem and solve an error. You need to process the data stream that caused the error. What should you do? A. From Azure Cloud Shell, run the az dla job command. B. From Azure Cloud Shell, run the az batch job enable command. C. From PowerShell, run the Resume-AzureRmDataFactoryPipeline cmdlet. D. From PowerShell, run the Set-AzureRmDataFactorySliceStatus cmdlet. ADF operates on data in batches known as slices. Slices are obtained by querying data over a date-time window, for example, a slice may contain data for a specific hour, day, or week. Such a query would use a date-time column notionally representing an effective date or a last-modified date. You have a Microsoft Azure Data Factory pipeline. You discover that the pipeline fails to execute because data is missing. You need to rerun the failure in the pipeline. Which cmdlet should you use? Use some PowerShell to inspect the ADF activity for the missing file error. Then simply set the dataset slice to either skipped or ready using the cmdlet to override the status. You plan to analyze the execution logs of a pipeline to identify failures by using Microsoft power BI. You need to automate the collection of monitoring data for the planned analysis. What should you do from Microsoft Azure? You can import the results of a Log Analytics log search into a Power BI dataset so you can take advantage of its features such as combining data from different sources and sharing reports on the web and mobile devices. To import data from a Log Analytics workspace into Power BI, you create a dataset in Power BI based on a log search query in Log Analytics. The query is run each time the dataset is refreshed. You can then build Power BI reports that use data from the dataset. D: To analyze data in HDInsight cluster, you can store the data either in Azure Storage, Azure Data Lake Storage Gen 1/Azure Data Lake Storage Gen 2, or both. Both storage options enable you to safely delete HDInsight clusters that are used for computation without losing user data. E: The Spark activity in a Data Factory pipeline executes a Spark program on your own or on-demand HDInsight cluster. It handles data transformation and the supported transformation activities. You are building an Azure Analysis Services cube. The source data for the cube is located on premises in a Microsoft SQL Server database. You need to ensure that the Azure Analysis Services service can access the source data. What should you deploy to your Azure subscription? Connecting to on-premises data sources from and Azure AS server require an on-premises gateway. You have a Microsoft Azure SQL database that contains Personally Identifiable Information (PII). To mitigate the PII risk, you need to ensure that data is encrypted while the data is at rest. The solution must minimize any changes to front-end applications. What should you use? Transparent data encryption (TDE) helps protect Azure SQL Database, Azure SQL Managed Instance, and Azure Data Warehouse against the threat of malicious activity. It performs real-time encryption and decryption of the database, associated backups, and transaction log files at rest without requiring changes to the application. A. Load the text files to ORC files, and then run dashboard queries on the ORC files. B. Load the text files to sequence files, and then run dashboard queries on the sequence files. C. Run the queries on the text files directly. D. Load the text files to parquet files, and then run dashboard queries on the parquet files. File format versatility and Intelligent caching: Fast analytics on Hadoop have always come with one big catch: they require up-front conversion to a columnar format like ORCFile, Parquet or Avro, which is time-consuming, complex and limits your agility. With Interactive Query Dynamic Text Cache, which converts CSV or JSON data into optimized in-memory format on-the-fly, caching is dynamic, so the queries determine what data is cached. After text data is cached, analytics run just as fast as if you had converted it to specific file formats. 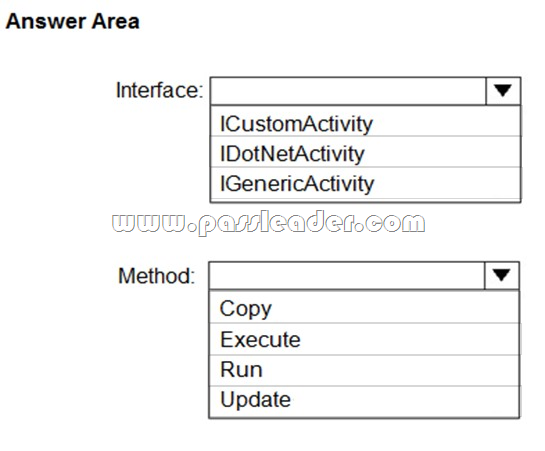 – Ensure that users can see the data from their respective department only. – Prevent administrators from viewing the data. You deploy a Microsoft Azure SQL database. You create a job to upload customer data to the database. You discover that the job cannot connect to the database and fails. You verify that the database runs successfully in Azure. You need to run the job successfully. What should you create? – Firewall configuration. The Azure SQL database or client-side firewall is blocking connections to Azure SQL Database. – Network reconfiguration on the client side: for example, a new IP address or a proxy server. – User error: for example, mistyped connection parameters, such as the server name in the connection string. Download the newest PassLeader 70-475 dumps from passleader.com now! 100% Pass Guarantee!